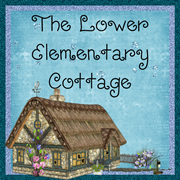 The Lower Elementary Cottage: Teaching Tips Linky Party! I'm only 2 followers away from my 100 follower giveaway!! I can't wait for you to see all the great goodies up for grabs!! My 100th follower will get one free item from my TPT store! If you are follower #100, please leave a blog post comment with your email and the one item you'd love to have from my TPT store! I have so many great ideas to share, but I'll stick to my Top 3! Often parents only hear from us when their child has done something wrong. I love to tell them when their kids have done something right! I send these home with at least one child a week... well actually, I just email them. Either way, they get instant great news. I send home a happy note for several reasons. If a kid has behavior struggles, I send one home on a particularly well behaved day. If a student struggles with writing, then writes an amazing story they get a happy note. If a student usually sits alone suddenly tries to interact with new friends, they get a happy note. I make a HUGE show of telling them about the Happy Note I'm about to send. I'll even read the whole email to them before I hit send. This is a great way of reinforcing great school choices when they get home. The parents always talk about how proud they are of the students when they get home. I often get a quick email response from a happy parent and I'll read it to the student. The kids get so proud of accomplishments that sometimes they even ask for Happy Notes, and usually I'll do it because it means the kids know they are doing great. Organization is the only way I survive my K-2 class! My biggest achievement is my set of daily folders. I have 6 folders: one for every day of the week, plus one labeled "next week." Every copy for the day is in that folder. I tend to plan a full week ahead (or more) and place all the copies for Monday into the Monday folder, and then Tuesday, Wednesday, etc. This is especially helpful for a last minute sub! All the work for the day is already sitting and waiting to go. I also like to plan ahead so I also have a set of folders for Language Arts, Math, Science, Social Studies so I can have a whole unit copied and ready to put in the folders for the week when the time comes. I get zero credit for this, I'm just obsessed with this program and love bragging about it! The kids earn points for good behavior. I have it on my iPhone and the kids get points all day. People with SmartBoards can do it on there even easier, but I don't have one. We are your 100th follower!! Congrats on reaching 100! Yay!! Thanks to you I was finally able to start my giveaway!! I am your newest follower (101)! I e-mail my parents weekly good and bad, using an app on my ipad. I tried to find the link, but sadly failed. Anyway, It is called Teacher's Assistant Pro. I use it to track my kiddos behavior all week (good and bad) and send home an e-mail report on Fridays! (i am not affiliated with these people at all, but I love the app). I'll definitely have to check that one out. I haven't seen that one before. Thank you so much for becoming a follower, and don't forget to enter my 100 follower giveaway now that it's up and running! Great tips! 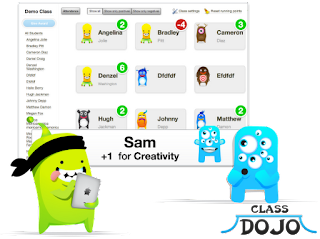 We use class dojo too and love it!! Thanks for linking up!